Make no mistake, I read what they’re saying. I see it virtually every day, from Bloomberg to independent investment blogs to Market Watch. I see the slings and arrows in the headlines and in the comments. Dogmatic. Zealot. Goldbug. Emotionally invested beyond rationality. Bleeding cash for three years straight. Unable to admit being wrong. Duped by hucksters. Dumb money. None of it bothers me in the least. Oh, the tone bothers me, to be sure- the unseemly pleasure taken from the (perceived) misfortune of others, the distasteful egoism and self-congratulatory glee. That is annoying. But the assertions themselves? I am utterly and completely untroubled… for one simple reason: I know, beyond doubt, that I am correct and am being proven more so with each passing day. But Pining, you dogmatic zealot you, how can you possibly sit there and say that you KNOW you are correct? Why can’t you bring yourself to admit that the 3 year bear market in gold and silver has proven your take on the world to have been utterly wrong? Aren’t you stupidly denying reality as it has been demonstrated to you? Haven’t you learned anything over the last three years? Yes, I have. The last three years have taught me that my investing worldview is utterly and completely correct. I am. And I’ll give you a few big reasons why. The supposedly ‘responsibly tapering’ US is in fact only somewhat behind the BOJ, as the Fed now owns 35% of all outstanding 10 yr treasuries (the largest, most liquid benchmark bond in the world), and a whopping 50% of all 10-15 year dated bonds. Currently, the Fed owns (i.e., has directly monetized) an almost unbelievable 2.3 trillion dollars in total US treasury debt of all maturity lengths. Longer-term forecasts, taper pretenses notwithstanding, put the Fed on pace to own all US treasury debt issuance by 2018. Those who denigrate gold and silver investors would have you believe that all of this can go on in perpetuity without consequences or negative effects on markets, wealth, productivity, or capital formation. I know better. 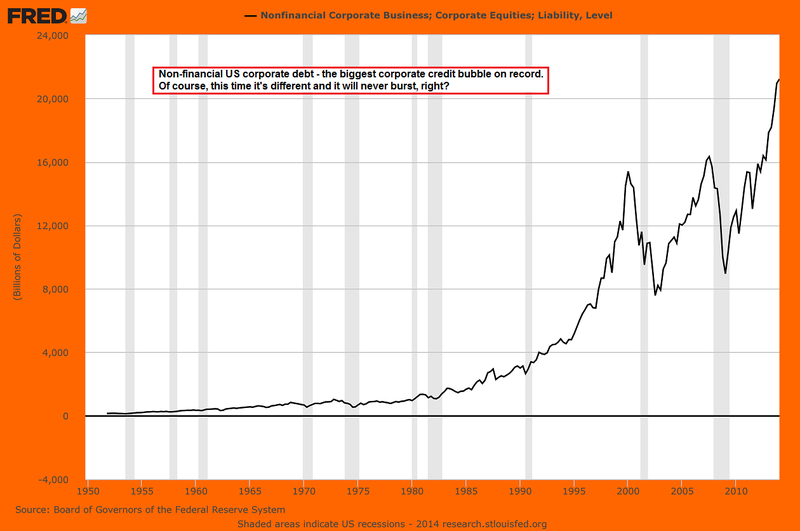 Public, private, corporate, household… you name the type of debt, it’s growing. Fast. Many people know that the US Federal Government debt is currently about 18 trillion. But did you know that ALL US debt, public and private, is now over 60 trillion dollars? Total US GDP is going to be around 17.5 trillion dollars in 2014. To put this in perspective, if we took a whopping 10% of our national gross domestic (impossible to do without leaving a smoking crater where our economy once stood, but let’s pretend), didn’t borrow another penny, and just used it to pay off what we currently owe, we could do it… in 35 years. The good news is that, with an employed workforce of just around 100 million in this country, the share of the debt for each person with a job today is a measly $600,000. With a median national income of 50k a year, I am sure that would be no problem. This would, of course, assume that we didn’t pay a dime of the additional 144 trillion in unfunded liabilities that we have passed into law and have promised to pay in the future, like Medicare, Medicade, Social Security, federal pensions, etc (which would take 10% of GDP every year for 116 years to pay off). If we decide not to stiff all those Medicare folks and pay all our unfunded liabilities, then each and every person person with a job in the US would have to pay 2 million. Yeah, that could happen. Our debts, both public and private, have already grown beyond any reasonable underlying ability to pay, and yet are accelerating. Those who denigrate gold and silver investors would have you believe that all of this can go on in perpetuity without consequences or negative effects on markets, wealth, productivity, or capital formation. I know better. One of the reasons we in the US have been allowed to accumulate such massive obligations is related to the role of the USD in international trade settlement. In the past, while we were running up these debts and taking out more, the idea underlying it all was simply that the world would always take our debt to trade with. A significant part of many people’s gold and silver investing thesis was the idea that the handwriting was on the wall for the end of the exorbitant privilege of world reserve currency status for the US dollar. Countries which produced tangible goods and products were getting very tired of having to accept dollars in payment… dollars which were being constantly devalued by reckless monetary policy and spendthrift politicians. So how has that been working out? China initiated direct oil and gas trade with Russia, skipping the USD entirely. All of this makes it ever more obvious that the alternative, non-dollar trade settlement system that China and Russia are constructing will contain gold as a core foundation and asset. The gold import numbers are staggering, but when top Chinese officials are saying publicly that China should ultimately aim to accumulate 8,500 tons in official gold reserves, which would put China on-pace to have the single largest sovereign gold hoard in the world, then it is clear that what Western financiers denigrate as a barbarous relic, Eastern financiers think will be a crucial and necessary asset in the future. I have yet to see a single rational, tightly-reasoned explanation by those who mock gold and silver investors for why all of the above will have no ultimate effect… all they can offer are snarky jabs about current price. As an investor, “All is proceeding as I have foreseen”. So let us review: The printing presses are humming furiously, the economy is not improving and its macro-fundamentals are unmistakably deteriorating. In the west, debt which cannot ever reasonably be repaid is accelerating, while rising financial powers in the east are buying gold as fast as they can, and their actions make clear that the death of the “exorbitant privilege” of world reserve currency status for dollar is quite far advanced. In short, every macro-trend is heading in the direction PM investors thought it would. Check US total corporate debt over the last 5 years (chart) then ask yourself, are companies balance sheets growing more or less stable? Is government becoming less intrusive in the economy, or more intrusive? Are valuations (stocks, bonds, rates) becoming more rational or less? Are markets becoming more freely-traded (i.e., do they reflect real-world forces of supply/demand) or are they more gamed and fictitious than ever? Is personal, corporate, or governmental debt getting larger or smaller? Is government and central bank management of the economy growing more successful or less successful over time? Every single one of these trends is growing more in our favor. Every. Single. One. Week after week, month after month, these forces are moving inexorably in one direction, and it is the direction I have bet on. THIS is why I can say that the main thing I have learned in the last three years is that the investing worldview which led me to gold and silver is proving to be absolutely spot-on. A tidal wave of fundamentals, macro-forces, and non-reversible trends is slowly building behind my stack, rising up inexorably until the noise and short-term movements (and yes, price manipulation) will inevitably be swamped by a tsunami that will carry everything before it. Timing is tricky, and I do not know precisely when this tidal wave will hit shore. Nor do I know whether it will be a fast raging wall of destruction or a slowly but inexorably rising tide, but I know for certain that it is coming… and when it does I will be standing safely on the financial high ground. My position there has been carefully prepared bit by bit, during the very period when gold and silver prices were falling and others were buying Netflix and crowing about it. In the meantime, I am not bothered in the least to be called “dumb money” by the blinkered souls whose vision doesn’t extend past the ticks on the daily. On the contrary, I consider it a ringing affirmation of my approach. Stack what you can, when you can. Do so with conviction, with confidence, and with peace. And when you are ultimately proven correct, try not to rub their noses in it. I’m a title examiner and every day I go through massive amounts of real estate paper work relating to transactions. I mention this because once in a blue moon i'll grab a prior title (our starting point in our search) and see that the same people have been living at a house for 30+ years... All time record for me? 54 years in one house! Lady just sold it a few months ago after her husband died. Every time I come across one of these old prior files where the people are still there, and have been their entire lives, I ALWAYS PULL OUT MY CALCULATOR and I ALWAYS crunch the numbers. You see every one of these prior titles has a purchase amount on it and EVERYTIME I run it against GOLD. I ask myself... what would they have if they invested in Gold instead? I come across these files about once a week and have for over a year now. GOLD WINS. Every. Time. Today I finally ran into this one : In 1966 this lady and her husband bought a house in Illinois for 22k - imagine that folks 22 freaking K for a nice single family house! Anyway... crunch the numbers boys...22k at $35 an OZ would have netted you 628.5OZs of gold in 1966. I have run this example on over 40 houses in the past year when the right prior comes along. GOLD. ALWAYS. WINS. The irony is that despite what that Swiss banker told Kirby (that gold has always been manipulated and supressed), the fundamentals still won out! They will never change so long as this system survives, but Gold has won out DESPITE all that has been against it.